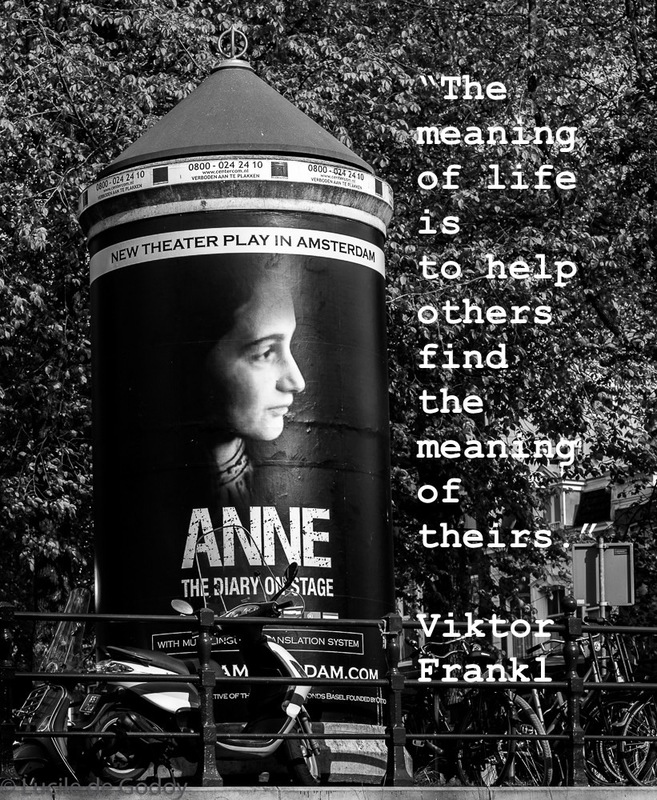 This week I bring a quote from Viktor Frankl, a concentration camp survivor. He wrote the book “Man’s search for meaning”, which is one of the most inspirational books I have ever read. His book has inspired readers from all walks of life. He was a psychiatrist and head of the department of neurology at Rothschild hospital in Vienna, a Jewish hospital that was closed down by the National Socialist government. He got a U.S. immigration visa but he stayed in Vienna to not leave his aging parents behind. They all were arrested and deported to four different concentration camps. In his book, he points out that “to achieve personal meaning, one must transcend subjective pleasures by doing something that points and is directed, to something, or someone, other than oneself… by giving himself to a cause to serve or another person to love.” Staying with his parents was the living proof of his beliefs. It wasn’t his imprisonment though, that led him to this way of thinking. His work with dying patients and quadriplegics sufferings has originated his argument that the quest for meaning is the key to mental health and human blossoming. He wanted to live for his wife, brother, and parents. He had a steely resolve to never give up or commit suicide. He wanted to finish his book on logotherapy and wanted to live for his future. After his liberation in 1945, he found out that he had lost his entire family. Contrary to many colleagues who then emigrated to other countries, he decided to remain in Vienna to help post war psychiatric patients, and made a very successful career. He found meaning for his life and dedicated it to help others find theirs. How contemporary this quote is, isn’t it? In whatever we do in life, there will always be something we can change, if we give our best to ourselves and to others. 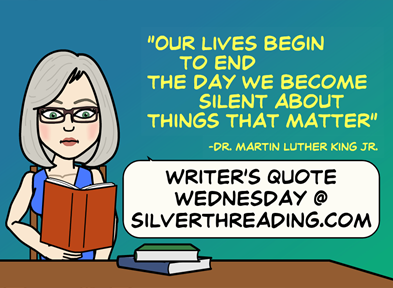 I am posting for Silver Threading Event, Writer’s Quote Wednesday. If you love quotes, it is the place to be. Thanks, Angeline. Appreciate your visit. I read Frankel’s book in college, finding it to be very good. Funny thing, I just put a copy of it away today at the public library where I work. That last quote makes me think of the state of affairs today. So much unrest and bigotry and hatred and violence. You’d think we learned something about respect for human life following World War II. That’s really a coincidence. Your words on today’s state of affairs resonate with me. Apparently we really don’t learn from history. Thanks so much for reading and adding very thoughtful words to this post. Great post, meaning of life is a difficult topic, need to be brave to discuss it. Love this post. I’m going to put that book on my Goodreads “want to read” list right now, before I forget. Thanks Amy. You won’t regret the reading. Thank you Lia, for appreciating this post. I try to bring meaningful thoughts and am glad you liked it. You find the perfect quotes each week. That last one in particular is perfect – current, resonant, providing some well-needed perspective. Sorry my dear, I totally miss to reply to you. Thank you so much for the lovely comment. This quote is so actual…. We really need someone reminding us of generosity! Apologies for replying so late to your considerate comment. Heartfelt thanks, Anna. You’re surely a very generous person, and needs no reminder! The meaning of life quote is just wonderful. So self-fulfilling if people would take the time to think about and apply it. Great post, Lucile. Apologies for such late reply, Lois. I fully concur with your views. Thanks much for your comment. Thank you, dear Lucile, for putting this book in my radar. He sounds like a very special and wise person and I shall have to read his book. I’ve read many books about WWII survivors and they can be so heartbreaking but also, an inspiration of hope from the amazing attitudes of the survivors. I am so sorry to reply so late, Barbara. Apologies. I hope you like his book. I don’t normally read a book twice, but this was an exception. I do hope to not disappoint you. I found it very inspirational. A great book for your quote. I’m amazed at the resiliency of humans in the worst conditions. Your summary reminded my of the Apostle Paul’s life as chronicled in the New Testament. Million apologies for such a late reply. Only today I am answering to the comments of this post. Thanks for mentioning the Apostle Paul’s life. I fully agree with your words. These quotes are so beautiful and timeless, Lucile. I will have to put “Man’s Search for Meaning” on my to read list. I’m always interested in the works of concentration camp survivors and this one sounds particularly fascinating. I took a Holocaust Literature and Film class in college so I’m surprised I haven’t heard of Viktor Frankl before…we read Primo Levi, Jean Améry, Tadeusz Borowski, and quite a few others…well, I guess there’s only so much time in one semester and it would be impossible to read everything. I also adore the picture at the top…the fact that we are still telling Anne’s story is one example us trying our best, I think. Dear Britta, apologies for the late reply. You left such a thoughtful comment and I hope I haven’t upset you. You indeed came across many books on the Holocaust and I think it would be impossible to cover them all. They might be quite similar although each experience is very unique. Viktor was a doctor and perhaps with clinical eyes, could also observe what was happening to others and how they reacted to it. Thanks for liking the photo. Anne’s story is indeed a great example. Agree with you. Oh, don’t worry, Lucile. I did wonder, but I figured life got in the way, as it has a tendency to do sometimes. In may ways, all Holocaust memoirs are very similar. After all, the Nazi regime was quite systemic in the way it carried out the final solution. At the same time, every survivor has a unique experience seen through their own perceptions of the world. I do appreciate individual accounts because of that. It makes the Holocaust, which can at times seem so far away and so difficult to comprehend, so much more human. I will try to get around to reading Victor…I am really quite intrigued now. I’m grateful for your understanding, Britta. And thanks for sharing so much knowledge about the theme. I haven’t read many books like these but have watched many documentaries sharing survivors stories. Always very touching and incredibly compassionate and forgiving people. I guess that when you have been through the worse, you become somehow someone who can more easily choose what to waste life’s previous time with, rather than entertain anger and hatred. If you ever read Viktor, let me know what you think. Words like this make you think just what is wrong with some people. Why do we do the things we do some times? And how powerful the human spirit. Where in the world do you get all your energy (and time) to write this stuff (and take photos). I haven’t even done Siri yet!! Is the Ann Frank photo yours? If so, how did you get the quote on it? Sorry for my late reply, Badfish. Life got in the way. You are right about your assessment. There has always been bad and good, right and wrong and this will never change. Unfortunately. But the human spirt always prevails. Do you know why I’m so late replying? Because I didn’t have all the time I needed (and energy) to blog, reply to comments, read other blogs and comment, and do all the other life activities. You can put quotes on your photos or whatever text you want if you use either picmonkey or pixrl. You can download it for free from the web. YOU! ran out of time? And energy? No way. But understandable. I can barely reply to comments, let alone go shoot photos, or write a new post, or read other blogs. I have not quite even got around to Siri. But by next week, I should have time. Good thing there is always a next week. I found a free site to add words to photos the other day, tried it. It’s called Canva. Heard of it? Oh yes, I do. I’m not a cyborg yet. 😉 I can overdo a lot but pay a price later. Multitasking is not clever nor healthy. Blogging should not be a burden otherwise the good feeling is over. When I started joining courses and went from one to another, I got the vibe and the fast pace, but had to sleep less hours as the world around me didn’t stop to wait for me. I’m currently reducing my activities and although I may post daily, I will schedule many over the weekend. I will write less and share more photos, which takes less time as well. However, I haven’t yet figured out how to be updated with replying to comments and reading each other’s blogs. It’s just overwhelming. But as you said, there is always a next week. I was answering last night to posts one week old. Not guilty. I am going to check this Canva site! Thanks. All is good in the world. And yeah, I don’t want blogging to be a chore. It’s not. It’s all that other stuff I gotta do that is the chore! Canva seems very easy. I put words on a photo. If I can, anyone can. Blogging has given me the opportunity to practice my one true love: writing. I believe writing is an exercise; indeed, a form of meditation. The act of writing puts my thought into perspective. Keeps me from becoming stuffed up, too moody, too lost. It allows me to put my past into perspective, and turn all my mistakes into assets rather than liabilities. Reaching out through the written word is one of the neatest things I get to do with my day. Yeah, I hear that! Blogging, for me, has offered a form of discipline that I otherwise do not have when it comes to actually putting something down on paper…er…cyber. That’s excellent! So you are becoming cyber! Not really and truly cyber. But there are certain things that make life easy. In response to the quote. You have though your friendship and support. Thanks much for dropping by, Sheldon, and also for the lovely comment. Much appreciated. I’m happy you like what you see here. Hi Lucile, I’ve long admired the work of Viktor Frankl. In particular, the notion that even when it seems everything is taken, we can still choose attitude. And sometimes holding to that takes steely resolve, which he certainly had. Great post, thank-you. Hi Jill, his experiences and words are indeed remarkable and I often reminded myself of those, when I don’t have the same steely resolve. Thanks for reading and I am happy you liked it. Great quote very moving and thoughtful,thanks for sharing.